Has the time finally come to potty train your little one? Have they seen how daddy does it and want to copy? Luckily we’ve found five of the best potty training urinals for the toddler who fits that bill. Toddlers learn by doing, and when it comes to potty training, many will likely want to do like their dad. The problem, however, is that the adult toilet is far too tall for a toddler’s aim. This is where a miniature urinal comes in handy. First, let’s discuss what you need to look for — believe it or not, the potty training urinal market is huge. Use the links above to check the latest prices or read our in-depth potty training urinal reviews below. You’re not the first mom to get confused by the vast amount of potty training urinals that are available. When I decided to purchase one for my toddler, I was shocked. But during potty training, toddlers will look and learn and it’s essential for mom and dad to be role models. That’s also why I feel urinals are an important part of the potty training process for little boys. Let’s take a look at the different types and what each one has to offer. These are probably the most standard types and are fairly simple to use. They generally attach directly to the big toilet bowl. Then your little one will have the target within eyesight and can aim better. Once your toddler has done the deed, you simply empty the urinal in the toilet or sink. This type is undoubtedly more versatile. As you can guess by the name, this toddler urinal stands by itself. A free-standing urinal has fixed support, placed right onto the floor. This is, in many ways, like a potty chair — you can place it anywhere you have space. This is an excellent tactic to use during potty training, as it reminds them to use it (source). Some parents opt to have these in the garden during summer time. Usually, you’ll still have to empty it manually, but some models can flush. These are generally also larger than other types. The area where your toddler can aim is wider and easier to target. This is a huge advantage if your little one finds it hard to hit the bullseye. This style is a favorite among many moms because you can adjust the height according to your toddler’s size. On the back of the urinal, there are suction cups that you attach to the bathroom wall. These potty training urinals usually consist of two pieces. One section is where the suction cups are, which you mount on your wall. The other is the detachable urinal that you take off to empty, unless there’s a hose attached. With that said, it’s crucial that the suction cups are of good quality. It’s not fun having a pee-filled urinal fall, spilling its contents on the floor. Potty training urinals are different from the adult version. Not only are they smaller, to fit shorter users, but many also come with helpful features. 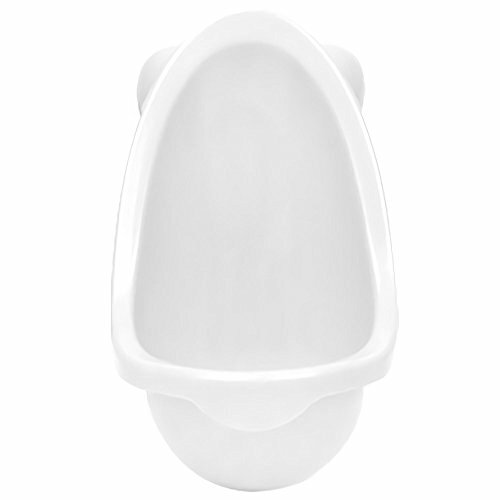 Urinal shape: Potty training urinals come in a variety of shapes, but the best are those that are round or oval. These turn inwards at the bottom, and this will keep the pee from splashing out. Drain friendly: These will have a hose that empties all the liquids, so just make sure you have a suitable drain nearby. This is not a must-have, but it is convenient for those who don’t want to empty the urinal manually each time. Fun aiming target: Your toddler may find it much easier to hit the bowl if there’s a fun target to try and hit. Some urinals have wheels that spin, others have a little toy figure to aim for. Here are some additional tips from another mom on how to potty train boys. Now that we know about the types and features available, it’s time to look at some of the best potty training urinals that the market has to offer. Whether you’re looking for an on-the-go solution or a semi-permanent bathroom fixture, we’ve got you covered. Toddlers base most of their choices on what looks intriguing and fun. Having a urinal that looks appealing is a definite plus, and will almost certainly encourage your child to use it. This urinal from Purple Safety comes near to perfect. Not only does it look super fun to use, but it also has plenty of great features. The whole urinal is frog-inspired. It has two large eyes at the top and is all green. In the middle of the catcher, there’s a water wheel that spins when your toddler pees. Water wheels are good target points. Your toddler gets to see it move when the aim is right, so it also becomes a type of reward. One invaluable feature is the included urine guard. In this case, it’s the tongue of the frog that assures all the liquids fall into the catcher. To top it off is the automatic drain system. There’s a hose on the bottom that you lead into a drain. Once your toddler has finished, the waste will flow away and all you have to do is clean the bowl with some water. Some parents said the water wheel can splash back. When you’re on the road, you can’t ask your toddler to stop their potty training. Doing so could cause a major setback in this delicate process. But with this portable urinal, you won’t have to. Now, please let your fellow travelers know that this is for pee and not water. It does resemble a large water bottle, but you don’t want to get the two confused! The first feature I’ll mention is its compact size. With its 7.3-inch height and 3.3-inch diameter, it can hold up to 500 milliliters, which is roughly 2 cups. You can easily fit it in your luggage or side bag, in case your toddler needs it on the go. What you’ll also love is the eco-friendly material. The plastic used is non-toxic polypropylene. It also has a strong seal so, once you close it, there’s less chance for accidents. After using, you simply empty it once you arrive at your destination, and then wash and leave it to air dry. The design is fun and toddler-friendly. It’s a bright colored elephant with a large “trunk,” which catches the pee. Some moms said it can be tricky to empty without getting urine on your hands. A wall-mounted urinal is a popular choice. As I said earlier, you can adjust the height any time, as your toddler grows. 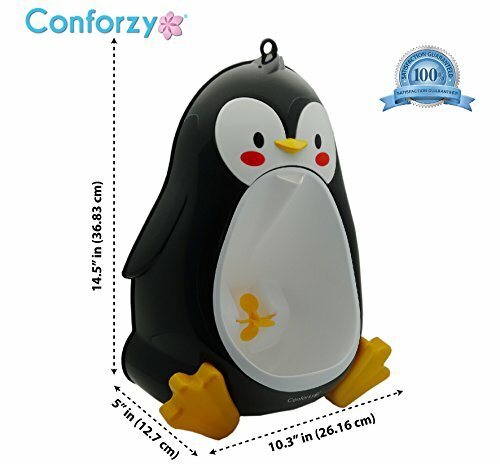 This penguin urinal from Conforzy is a great example. First of all, let’s talk about the look of this thing. 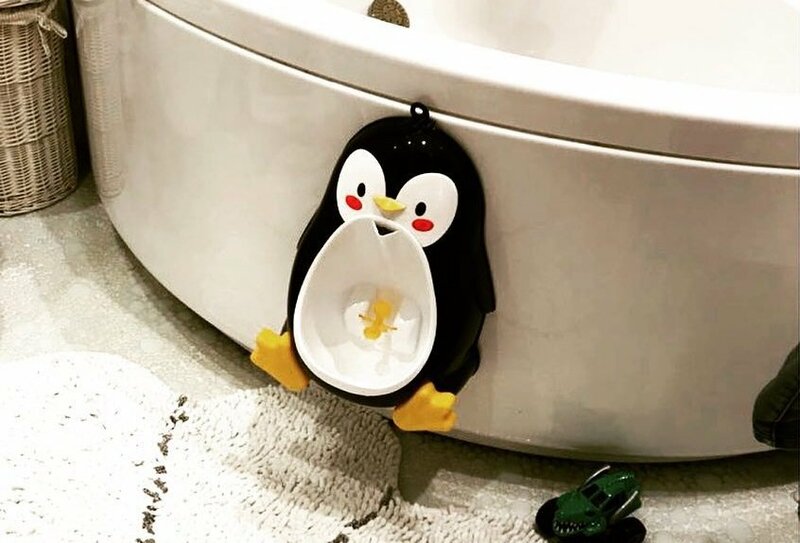 It’s a small penguin with a deep stomach to catch the pee. It’s environmentally friendly, non-toxic, and odor-resistant. Your toddler will love the target in the middle. It’s a small water wheel that turns when a stream of pee touches it. This requires some focus, but it’s good practice for a busy toddler. The penguin consists of two pieces — one that you mount on the wall, and the other is the urinal. The wall piece attaches using extra strong suction cups. The urinal part is easy to remove and clean. With that said, the wheel requires a strong stream to turn. This might not be easy for a newbie urinal user. But it might motivate them to continue practicing! The water wheel may be hard to activate for newbies. This free-standing urinal from Peter Potty is perfect for potty training toddlers. Your little one is already taking a step closer to independence, and a free-standing potty will surely help. The urinal looks quite normal — no animal design or crazy shape. The bowl of the urinal is slightly curved inwards, meaning there’s less chance of spillage. Now, unfortunately, there’s no target to aim for. However, instead Peter Potty installed a real flush. All you have to do is refill it before use and once your toddler has finished, he can flush. The water will spray into the catcher with the push of a button, then you can empty it afterward. The flush gives the urinal a realistic touch. Additionally, it will dilute the liquids which should make cleaning easier. At the bottom, there’s the removable catcher. It looks like a drawer, but instead of socks, you’ll find pee. The drawer holds up to 50 fluid ounces of liquid, so you may only need to empty it once a day. You can also hang this on the wall for more stability, by using the suction cups provided. Curved bowl — no spillage. 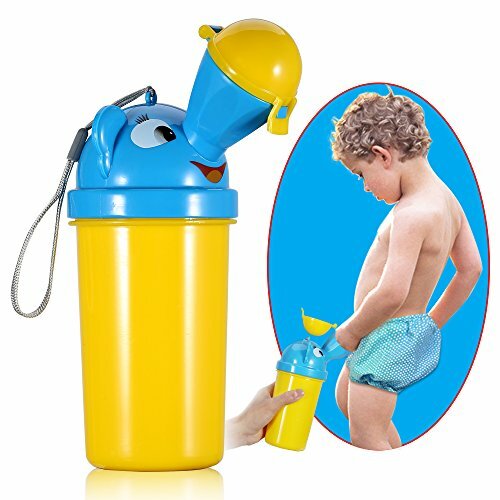 Removable, large capacity pee catcher. Free standing or wall mounting. No fun target to aim for. Some reported leakage from the water tank. Having a hanging urinal proves helpful in many ways. First of all, it’s not as big and bulky as some other types might be. This example from TheJD is simple and efficient. It’s also super easy to set up, and comes with clips that you can quickly attach to the toilet bowl. Once you’ve mounted the clips, you can remove and reattach the urinal as you please. The urinal is lightweight and goes smoothly under the sink to clean. What you’ll also love is the large capacity — there shouldn’t be any spilling. Even after the juice during snack time. Another great plus is that you can adjust the height. The urinal can also attach to the wall once your toddler outgrows the toilet option. The suction cups provided don’t stick to textured surfaces, although it can be fixed to a wall with screws if preferred. The urinal comes in five different colors, so maybe your toddler could pick their favorite option for some encouragement. Attaches easily to the toilet. Wall mounting is an option. The suction cups won’t stick to uneven surfaces. Some moms say the clips are small so the product can be knocked off the toilet easily. Potty training urinals are excellent for getting boys used to standing up while peeing. However, there’s a large market and some aren’t as efficient as others. It’s essential to find one that won’t spill, is easy to clean, and looks appealing to a toddler. 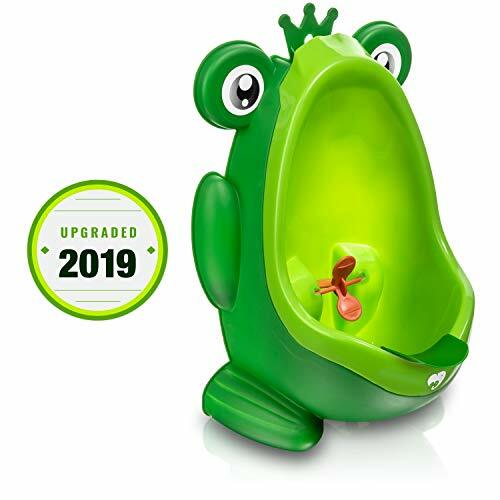 That’s why I think the Frog training urinal for boys is the best potty training urinal. It’s fun to look at and to use, and it even comes with a drainage system. Did you find your toddler’s favorite urinal? Please leave a comment below. And make sure you hit the share button before you go-go. A urinal is a great idea for little boys. My second is starting to potty train right now. I have him sitting, but once he learns I will think of a urinal. I have seen the frog one on the wall, those are great. A portable one is something I never thought about. I love how you wrote the pros and cons or each one. Makes it so much easier. Saving this to use in a few months. Rachel from Explore Kid Talk.